Digital UltraViolet and Digital Copy will makes it possible for you to stream the movie Beirut HD UV or iTunes Code instantly to your computer and compatible Smartphones, Andriod, iphone, iPod Touch, iPad and tablets devices anytime, anywhere. 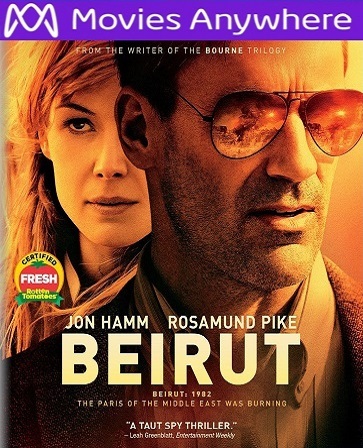 You can also download a Digital UltraViolet Copy or a Digital Copy of the movie Beirut HD UV or iTunes Code to your computer and compatible devices. Who do you trust in a world where the truth emerges only when it's convenient – or profitable? From the writer of the Bourne trilogy, this taut action thriller also stars Rosamund Pike and Dean Norris and is being hailed by critics as "tense & ever-twisting" (Richard Roeper, Chicago Sun-Times).